There is something torturing about having a midafternoon race. As a rower, you’re used to the early morning routine. Wakeup. Eat. Train. Eat. All well before 10am. On a race day that involves a 3:17pm race time, this disrupts the schedule of both the body and mind. I woke up early, stared at the ceiling for a while. Fixed some oatmeal, began hydrating, and sat quietly on the air mattress I’ve been sleeping on the past couple of nights trying not to disturb the other house guests. 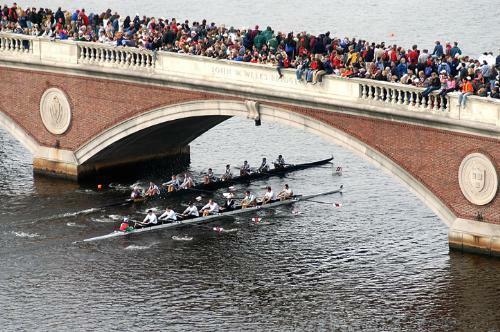 I’ve come to learn that the Head of the Charles serves as a reunion weekend for many high school, college, and club teammates all making the trek to the Rowing Mecca that is Boston on Head of the Charles weekend, whether it is for competition or just to revisit the memories of when they were an oarsman/woman. My doubles partner graduated from Boston University and lives in Boston, so is hosting a few of her college teammates. It is also customary for doubles partners to stay together the week/weekend of a race. Not having been a part of the college rowing scene, I’ve enjoyed getting a glimpse of the reunion experience through her and her friends. I now find myself fidgeting, surfing the Internet watching inspirational sports videos, and mentally running through the Charles course–the build into the start of the race, every stroke, nailing the turn at the Weeks Bridge, passing boats, and the sprint at the end, finishing strong. I’ve glanced down at my watch a hundred times, unpacked and repacked my racing gear in my backpack, and checked the Head of the Charles website a dozen times even though I’ve memorized the lineup for the Women’s Champ Double. Focus leads to success. You’ve got this. Hang in there and try to have fun! Good luck Meghan! You’ll be on the water in no time. Persoanlly, I’d rather be on the water today than in Master Control watching so much college football…. well… maybe. Seriously, you are at the premier autumn rowing event in the US. Have a great time and soak in the atmosphere! Bets of luck, again!